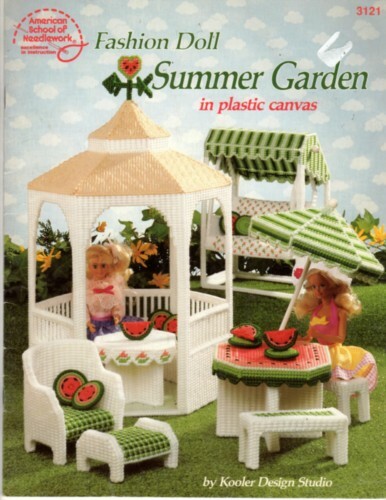 American School of Needlework Fashion Doll Summer Garden in Plastic Canvas plastic canvas pattern booklet. Kooler Design Studio. Sandy Scoville. Watermelons, Small Table, Gazebo Seat, Footstool and Bench, Gazebo with Weather Vane, Wicker Chair, Large Table with Umbrella, Swing. ****This booklet appears to be in like-new condition. Two notes inside front cover in margins. Does not affect pattern pages. Partial price tag on cover. **** Out of print.